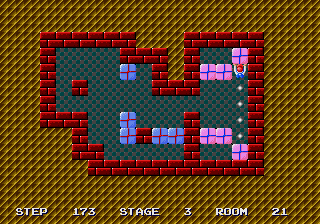 Room twenty-one is more complex puzzle with eleven boxes for placement on the right. Go LEFT, push LEFT and LEFT. Push DOWN, go LEFT, LEFT, UP, push RIGHT, RIGHT, RIGHT, RIGHT, go UP, RIGHT, push DOWN, DOWN, go RIGHT, DOWN and push LEFT. Go UP, LEFT, UP, LEFT, LEFT, LEFT, LEFT, UP, push LEFT and LEFT. Push DOWN. Push RIGHT, RIGHT, RIGHT, RIGHT, RIGHT, RIGHT, go UP, RIGHT, push DOWN and DOWN. Go UP, LEFT, LEFT, LEFT, LEFT, LEFT, LEFT, LEFT, UP, UP, UP, LEFT, LEFT, LEFT, DOWN, DOWN, DOWN, RIGHT, push RIGHT, RIGHT, RIGHT, RIGHT, RIGHT, RIGHT, RIGHT, RIGHT, RIGHT, go UP, RIGHT, push DOWN, DOWN and DOWN. Go UP, LEFT, LEFT, UP, LEFT, LEFT, LEFT, LEFT, LEFT, LEFT, LEFT, DOWN, DOWN, RIGHT, push UP, go LEFT, UP, push RIGHT, RIGHT, RIGHT, RIGHT, RIGHT, RIGHT, RIGHT, go DOWN, RIGHT, push UP, UP, go RIGHT, UP and push LEFT. 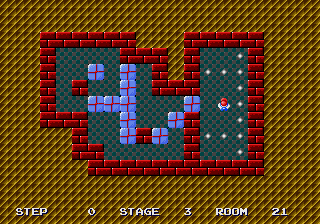 Go DOWN, DOWN, LEFT, LEFT, LEFT, LEFT, LEFT, LEFT, LEFT, UP, UP, UP, LEFT, LEFT, DOWN, push RIGHT, go UP, RIGHT, push DOWN and DOWN. Go UP, LEFT, LEFT, LEFT, DOWN, DOWN, RIGHT, RIGHT, push RIGHT, RIGHT, RIGHT, RIGHT, RIGHT, RIGHT, RIGHT, go DOWN, RIGHT, push UP and UP. Go DOWN, LEFT, LEFT, LEFT, LEFT, LEFT, LEFT, LEFT, UP, UP, LEFT and push DOWN. Go UP, LEFT, LEFT, DOWN, DOWN, RIGHT, push RIGHT, RIGHT, RIGHT, RIGHT, RIGHT, RIGHT, RIGHT, RIGHT, RIGHT, go DOWN, RIGHT, push UP, UP and UP. Go DOWN, DOWN, LEFT, LEFT, LEFT, LEFT, LEFT, LEFT, UP, UP and push LEFT. Go DOWN, LEFT, LEFT, UP, UP, RIGHT, push DOWN, DOWN, go LEFT, DOWN, push RIGHT, RIGHT, RIGHT, RIGHT, RIGHT, RIGHT, RIGHT, RIGHT, go DOWN, RIGHT, push UP and UP. Go DOWN, LEFT, LEFT, LEFT, LEFT, LEFT, LEFT, DOWN and push LEFT. Go UP, LEFT, LEFT, DOWN, DOWN, RIGHT, push UP, go LEFT, UP, push RIGHT, RIGHT, RIGHT, RIGHT, RIGHT, RIGHT, RIGHT, RIGHT, go UP, RIGHT, push DOWN and DOWN. Go UP, LEFT, LEFT, LEFT, LEFT, LEFT, LEFT, LEFT, LEFT, DOWN, DOWN, DOWN, RIGHT, RIGHT, RIGHT, RIGHT, push UP, UP, go LEFT, UP, push RIGHT, RIGHT, RIGHT, RIGHT, go UP, RIGHT and push DOWN. Go LEFT, LEFT, LEFT, LEFT, DOWN, DOWN, DOWN, LEFT, push UP, UP, go LEFT, UP, push RIGHT, RIGHT, RIGHT, RIGHT, go DOWN, RIGHT, push UP, go LEFT, UP and push RIGHT. Go DOWN, LEFT, LEFT, LEFT, LEFT, DOWN, DOWN, DOWN, LEFT, LEFT, push UP, UP, go LEFT, UP, push RIGHT, RIGHT, RIGHT, RIGHT, RIGHT, RIGHT and RIGHT. Congratulations. 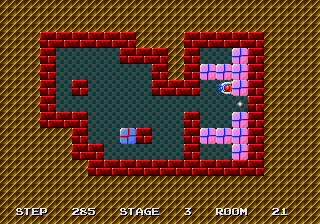 You have completed room twenty-one. Now try room twenty-two. 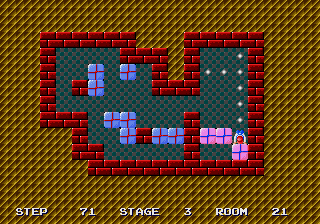 For this room, the solution for BoxWorld - World 53 works as well.